Jay Norwood Darling was born in Norwood Michigan, in 1876. He spent much of his youth in Sioux City, Iowa, when that Missouri River town was a gateway to unspoiled prairies. He attended college in Wisconsin and South Dakota. In 1906 Darling married Genevieve Pendleton. They had two children, John and Mary. An affable, dynamic, and talented man, Darling began his cartooning career in 1900 with the Sioux City Journal and retired 50 years later. 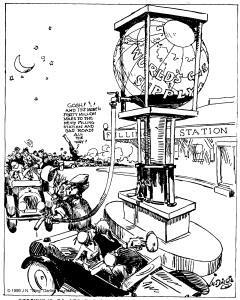 After joining the Des Moines Register as a cartoonist in 1906, he began signing his cartoons with the nickname "Ding" - derived by combining the first initial of his last name with the last three letters. A top-ranking political cartoonist syndicated in 130 daily newspapers, Darling reached an audience of many millions with cartoons noted for their wit and political satire. He was awarded Pulitzer prizes in 1923 and 1942, and in 1934 was named the best cartoonist by the country's leading editors. Conservation and politics were Darling's abiding passions. Concerned with pollution and the extinction of wildlife, he worked these themes into his cartoons. An avid hunter and fisherman himself, Darling used his cartoons to emphasize that regulations governing these sports should be observed. As a conservationist, he believed that people can benefit from nature without damaging it. In July 1934, President Franklin Roosevelt asked Darling to head the U.S. Biological Survey, the forerunner of the U.S Fish and Wildlife Service. In this capacity, Darling battled for greater national attention and expenditures for conservation. Darling was responsible for securing some $17 million for wildlife habitat restoration. He established the Migratory Bird Conservation Commission and made great strides toward bringing hunter and conservationist together. He also pioneered leadership in the field of proper game management. 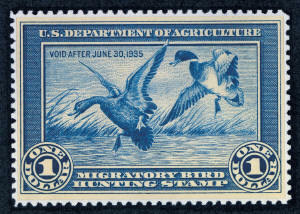 Darling initiated the Federal Duck Stamp Program, which uses the proceeds from the sale of duck hunting stamps to purchase wetlands for waterfowl habitat. In fact he drew the first Duck Stamp. Largely responsible for the establishment of the network of game refuges in the country today, Darling was called "the best friend ducks ever had." He liked to remind overzealous developers that "Ducks can't nest on a picket fence." For many years, Darling had a winter home in Florida on Captiva Island. Through the efforts of his island neighbors and the J.N. "Ding" Darling Foundation, a refuge was created on Sanibel Island from land donated by concerned citizens and acquired by the federal government. Administered by the U.S. Fish and Wildlife Service, the Sanibel National Wildlife Refuge has protected habitat for wildlife since 1945. It was renamed in Jay Norwood Darling's honor and officially dedicated to him in 1967. The "Ding" Darling Wildlife Society-Friends of the Refuge supports J.N. "Ding" Darling National Wildlife Refuge in its education and conservation missions. Darling's art reflects issues important to us today. 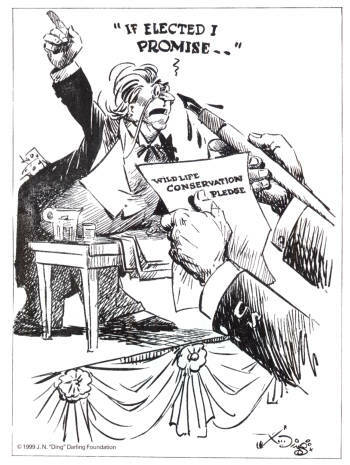 For example, feeling that every candidate for public office should pledge to conserve wildlife, he drew the "Don't say it - Sign it" cartoon (below) for the 1938 congressional campaign. The cartoon has been widely reprinted ever since. David Lendt reminds us in his biography of Darling that thanks to this one man, much natural habitat has been protected across the United States. This was largely due to the enlargement of the National Wildlife Refuge system and to the enduring success of the Federal Duck Stamp Program. The Smithsonian News Service reported: "Millions of Americans visit these refuges each year, awed by the sight of tens of thousands of colorful waterfowl and other wildlife. 'Ding' Darling would be pleased." Watch this excerpt from the biopic America's Darling. To order a copy of the full documentary, click HERE.